Hair Growth Hypothyroidism Diet, Indian Recipes for hair growth and Hypothyroid. Hypothyroidism is a condition in which the thyroid gland of our body fails to produce enough thyroid hormone which is extremely essential for various metabolic functions in our body. This may be evidently visible with simple blood tests of TSH (thyroid stimulating hormone), T3 and T4. Prolonged persistence of hypothyroidism or hyperthyroidism both can lead to hair fall. Now, what’s the connection between Hypothyroidism and hair fall? Your scalp is where the hair grows from its roots. Hair grows for a particular period and then falls out. It is followed by a new regrowth. This is hair cycle. So some hair fall on regular basis is absolutely normal. It’s only when the new hair growth fails to occur, then it is termed as hair loss and this is a common symptom of hypothyroidism as this hormone imbalance affects other bodily processes. Mild changes in thyroid levels usually doesn’t cause hair loss. It’s the profound and long term persistence of hypothyroidism which causes hair loss very likely to be seen as bald patches and sometimes even affecting the hair of the eyebrows. Occasionally it is even the medication to control this condition which leads to hair loss. But the good news is that if the thyroid levels are restored, hair loss will stop though it may take several months for your hair to grow back. You can work with your doctor on medications that help you control this thyroid related disease. Meanwhile you can work up on your diet to get hypothyroidism under control. Check out the list of foods allowed and not allowed for Hypothyroidism. Simultaneously also aim at providing nourishment to hair by watching what you eat. Concentrate on key nutrients like iron (which helps in providing oxygen and nutrients to hair), protein (necessary of cell growth and hair strength), zinc (required for hair growth) and antioxidants vitamin A, vitamin C and vitamin E (which will protect your hair from free radical damage). A multivitamin tablet prescribed by your doctor will be an additional boost to your hair – to get back the hair texture and growth. Add a glass of antioxidant boost to your breakfast. Try our tested juices like Carrot and Red Pepper Juice and Papaya Coconut Drink. Rajma Salad and Moong Dal ki Chaat will help you get a protein and zinc boost. As a healthy multi-vitamin snack reach out for Citrus Watermelon Salad or Avocado Dip. Include these healthy delicacies and dodge away processed, refined and sugar based items from your list. Burgers, pasta, pizza, biscuits, jams, jellies, cakes, pastries and alcohol top this list. A few other ingredients which are bets avoided are soy, cruciferous vegetables, such as broccoli and cabbage, brussel sprouts, cauliflower, kale, turnips, and pak choi as well as nuts like almonds, cashew, peanuts, flax seeds, walnuts, and pine nuts as they have thyroid inhibiting compounds. Trying a gluten free diet also help some get thyroid levels under control. Chalk out a meal plan with your doctor and dietitian that would suit you and help you establish control over this hormone imbalance and help in hair growth. 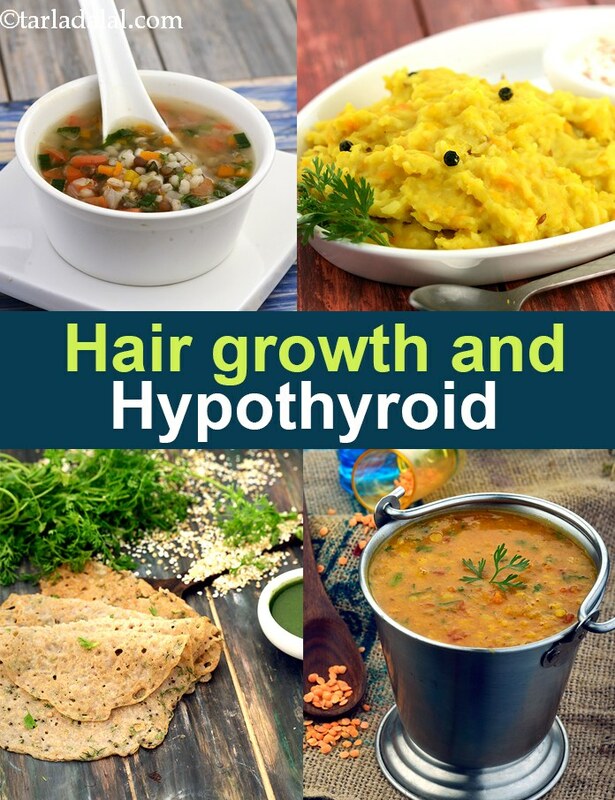 Enjoy our Hair Growth Hypothyroidism Diet, Indian Recipes for hair growth and Hypothyroid and other thyroid recipe articles below.